Altocumulus castellanus clouds often known by their abbreviation ACCAS are clouds that if you see them, there is a need to give you a heads up alert. They are the most dangerous altocumulus clouds that can in themselves develop to bring thunderstorms or heavy rainstorms. They form at any height from 2,500 to 19,000 feet. What are altocumulus castellanus clouds? They are particularly noticeable as they form tower like forms stretching up into the sky. The name castellanus is totally appropriate as these clouds literally tower in to the air caused by particular atmospheric conditions. The formation of these clouds can be a warning or heads up that more extreme weather is on its way in the form of cumulonimbus clouds that can result in violent thunderstorms or heavy rain. How are altocumulus castellanus clouds formed? 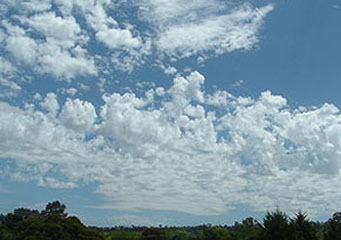 Altocumulus castellanus clouds are formed in a way that is very similar to other types of altocumulus clouds. It is necessary to have relatively calm weather conditions on the ground with only a gradual up draft of warm air laden with water particles that rise gradually into the air. However unlike other forms of altocumulus cloud the altocumulus castellanus cloud is an indication of bad weather that will arrive soon, in the more or less 12 to 48 hours. When you see altocumulus castellanus clouds, they are giving you signs of mid altitude air instability that could lead to cumulonimbus clouds forming and result in thunderstorms or bad weather developing. What height are altocumulus castellanus clouds found? Altocumulus castellanus clouds can be found at the same height of other altocumulus clouds that is from 6,000 ft to 20,000 ft. The difference with other forms of altocumulus clouds is that their towering shape makes them far larger than most other forms of altocumulus clouds. If the air conditions are sufficiently unstable the altocumulus castellanus clouds can easily evolve into cumulonimbus clouds which can lead to thunderstorms or heavy downpours. How common are altocumulus castellanus clouds? Altocumulus castellanus clouds can be formed when the conditions allow surface based moisture to be carried to higher altitudes that the cumulonimbus lower levels. This ability to be able to rise anything between 6,000 and 20,000 ft mean that the clouds can be made up of water particles at lower level and ice crystals at the higher altitudes. Should the altocumulus castellanus continue to develop, the base of the cloud will start to descend to lower altitude and it will no longer be an altocumulus castellanus cloud but a cumulonimbus cloud. These clouds are normally formed when a cold front is approaching; the impact of colder dryer air on the warmer humid air will result in storm activity. Pilots are therefore warned to fly round these cloud formations as they should be treated as dangerous.